Stylists Jane Ziemer, Kim Fernandez, and Cori Norton assumed ownership of OPC Salon in 2016. They were ready to make significant changes to their website and digital services. The salon's website had gone through several redesigns during the past few years. Jane, Kim, and Cori wanted a site that would bring in new customers, while giving visitors a sense of who they were and what made OPC unique. They also wanted to break the redesign cycle. They had tried a number of different development models before, including managing the website themselves and having an acquaintance develop the site for them, with limited success. There was nothing dynamic about it … I was supposed to make edits to the site, and I didn't have the existing knowledge, and I didn't have time to get myself up to speed so that I could take that on. Maybe I could make minor changes, but doing anything dynamic with the website? I didn't know how to do any of that. Our first step was to develop a website based on shared principles. If you've ever been involved in a website redesign, you know how things can get delayed and derailed by unquestioned assumptions. Having shared objectives from the beginning would help reduce the time it took to make design decisions down the road. To get everyone on the same page, we held a few kickoff meetings, and even played some games. One thing we wanted to do was determine the voice and tone we would use throughout the website and other digital products we developed. If we all agreed on how we would speak to customers, there would be less time required for approval, revision, and overall internal debate. We could deliver new features and content faster. We all sat down over a few beers and played a game using BrandSort Cards. Each card has one adjective. Jane, Kim, and Cori placed the cards under different categories, like "We are", "We are not", and "We are torn". We would return to these results during the redesign process whenever there was debate about a particular design choice. So, we recalled the card sorting exercise, where everyone had agreed that the salon's personality is professional but also warm, relatable, and approachable. So, not using contractions would be out of character for the salon and would distract or even turn off the salon's clients. What could have been a source of ongoing uncertainty or debate was put to rest because we had established alignment early in the process. Exercises like these are basically stakeholder interviews disguised as games, and we've found them to be incredibly valuable. What is the point of a salon website if it doesn't bring in more revenue? We believed that offering visitors the option to book online would increase revenue, which was a core business objective. We knew we were going to provide an online booking option, but to see if online booking was as valuable to clients as we believed it would be to the business, we ran a top tasks survey. We provided customers with a list of features and content and asked them to pick the three options they valued most. The results of the survey would help us determine how much time and effort should be devoted to online booking. Much like the card sorting exercise, the top tasks analysis has been a source of shared truth throughout our work together. When in doubt, we can refer back to what clients say they value most to help determine what projects we should prioritize. Confident that everyone would benefit from an online booking solution, my inclination was to use an out of the box solution. For example, the salon was already using MindBody to manage transactions — why not just integrate that with the website? I didn't realize how complex booking with a salon can be. Are they a new or returning client? What services are they looking for? What outcomes are they looking for? Do the services they're looking for match up with the outcomes they're looking for? Do they know which stylist they want to see? Is the stylist they want to see the best stylist to deliver the outcomes they're looking for? Is the desired/best stylist available when the client would like to visit the salon? And now factor in that schedules are constantly changing with clients who arrive looking for one service sticking around for additional services. The team had tried packaged software solutions before, but with so many changing variables, it had always led to frustration for everyone involved. It's understandable why they had decided to stick an email address or simple contact form on the old website. But we all agreed that simple solutions didn't provide enough guidance for clients. With email-in or simple form options, clients were presented with essentially a blank page and a blinking cursor. Without guidance, people would have to call to make an appointment, which meant the business had to be open and the phone line had to be free, or they had to leave a message to get a call back. Let's face it. People should be able to reach businesses by phone, but it's not exactly the way of the future. We supply customers with our business phone number today the way businesses offered a fax option 20 years ago. And what happened if someone did email the salon to book an appointment? Inevitably, the client wouldn't provide enough details, which meant a lot of back and forth by email or phone — a waste of time for employees and clients. So email was awful and the existing software options were too rigid. And creating a custom booking solution from the ground up would be too costly. But we all agreed that the website should be collecting appointments. What business owner doesn't want to make money while they sleep? The only way to do that was to use existing technologies to make something new. How could we develop a booking system that was flexible and efficient? I began working on a booking form using TypeForm, which let us present questions using conditional logic — Users would only see questions that were relevant to them. For example, returning clients wouldn't be asked for all their contact info, and anyone requesting a junior stylist would be presented with a message that they would be charged less, but their appointment could take longer. We also set up the form to grow the salon's mailing list, and we added the option for users to upload photos of their current hair style, as well as the look they hoped to achieve. The option to upload photos proved to be very popular. It helped the team determine who would be the best stylist to work with different clients, and it gave stylists the chance to prepare for incoming clients who were looking to make big changes to their style or color. Using the new system, new clients would still need to be contacted by phone to confirm their credit card information in case of a last minute cancelation, but returning clients could mostly be confirmed without further communication. I set up an Airtable database and introduced some automation to help manage the incoming inquiries. The online reservation form is a series of questions that helps the receptionist narrow down what service the client is looking for, when they should be scheduled, and which stylist is best for them. In a world where everyone is on their phones all time, [the online booking system] helps people connect with us when it’s convenient for them — maybe they are on the train or in the doctor's office where they are unable to talk on the phone. It's hard to overstate how important self-service options are to customers these days. People have more choices than ever, and if your business is closed and there's another company that can let customers do business on their terms, why would they wait for you to open or for your phone line to be free? And there are plenty of people who just do not want to do business by phone. They don't want to talk to someone, they don't want to leave a message, and they don't want to play phone tag. Other customers may be trying to contact you from work or in some other environment where they don't want to be overheard. Or maybe they're lying in bed with a napping baby. Maybe they have a disability that prevents them from doing business over the phone. There are a million reasons why customers can't or won't call you, but will do business with you online. We have this constant stream of new clients … and I feel comfortable knowing that we are reaching these people … and they can see from our website that clearly we care enough to have a website that's dynamic and tries to make their life a little easier when it comes to making an appointment. The new OPC Salon website launched in March, 2017. The salon immediately began receiving appointment requests through the online booking system. I had expected most submissions to come through outside of business hours, but we found that most people were submitting appointment requests on weekdays, around midday. So, even though the salon was open for business, a significant portion of people preferred using the online system rather than calling. Now that the site was live and we were collecting baseline information on usage, we wanted to see how we could improve the design to increase revenue. Over the following months, we tested and tracked many changes. We created new booking forms for individual stylists, tested various promotions, and more. And as 2017 came to a close and we began planning for the new year, we became more calculating in our efforts to measure the impact of design changes. You can increase website revenue by increasing the conversion rate (i.e., getting a larger percentage of the people who visit the website to make an appointment) or by increasing traffic (the percentage of visitors making an appointment remains the same, but revenue increases because you have more visitors). In December of 2017, we chose to focus on the latter option. Our first step was a major update to the salon's home page. Throughout 2017, the home page was basically a collection of images that linked to other pages on the site. I believed that by introducing more content on the home page, we could better guide visitors toward making an appointment, and we could grab more local search traffic, thereby generating more revenue. I also began testing new home page titles and descriptions to see which would help the site rank better in local keyword searches as well as improve click through rates. Here’s a look at the site's keyword rankings and organic search traffic over the past year. Beginning in December, we made monthly updates to the home page, with the most significant updates in December, February, and March. Traffic from organic search improved (shown as the grey line), as did local search rankings (the blue and green portions of the bar are page one rankings in Google). March also brought the departure of a lead stylist, which I'll talk more about later in this post. It was nice to see site traffic and rankings improving, but traffic and rankings aren't conversions. Traffic is not a business goal. So none of these experiments amount to much unless the traffic and rankings lead to more conversions. Conversions and organic search don't match up exactly, but they certainly share a similar trend line. More importantly, website analytics show that an increasing percentage of appointments made using the online booking system are coming from people searching Google. Visitors arriving at the site from an organic (Google) search who then proceed to make an appointment through the site are up 356%. Bookings from direct traffic were up 28%. And, while 7% of traffic came from social media, no one visiting from a social media site has gone on to make an appointment. Social media has its place, and it's possible that some people who encounter the business first through social media return later to make an appointment, which wouldn't show up in analytics. But we found that there was much more gain to be had by investing in organic search than social media campaigns. In March, a lead stylist left the salon. Employees come and go, of course, but when a stylist leaves a salon it can hurt business. Some clients who have been seeing that stylist for years will ask themselves whether they might try out a new salon. To minimize attrition, we quickly developed a new booking form and launched a promotion for the departing stylist's clients. I had hoped that between the promotion and the increases we were seeing through the content experiments, we could at least avoid a slump, and maybe sales would continue to climb. In fact, March and each proceeding month wound up meeting or exceeding conversions for any month up to that point, as shown above. Many things have contributed to the salon's success over the past few years — not least the talented stylists who do great work day in and day out. But we can also be confident that design has played an important role when we see such clear relationships between user behavior and conversions over a sustained period of time. Comparing the first and second quarters of 2018. As I wrap up this post, the most recent quarter's sales from the website have increased 54.6% over the previous quarter. The most recent data on website sales is promising, but I was curious to see if the website's success had come at the expense of clients booking over the phone. In other words, are clients booking appointments through the website instead of booking over the phone? If the website is just cannibalizing phone sales, then what have we accomplished? Providing a better experience for users and making life easier for employees is valuable, but our aim was to also grow the business. This proportional chart shows sales growth across all channels alongside the increase in new clients. 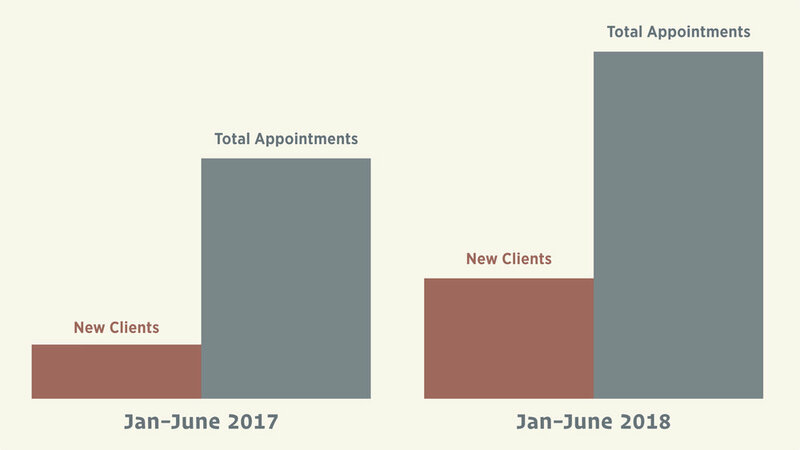 Appointments made through the website have not cannibalized appointments made over the phone. Moreover, the number of new clients has increased by more than 50%, which echoes the results we've found from our various analytics sources. Would you like to increase your revenue by improving your digital products? Schedule a micro-consultation with SuperHelpful Founder, Kyle Bowen.